The Herbertstown Branch of the Grand Canal (known today as the Corbally Branch) is still in water as it is the feeder for the Naas Branch. Water is fed from springs in Corbally Harbour, then through a large pipe under the old Limerick Road, then past Naas Harbour and through the locks on the Naas Branch, to the Main Line of the Grand Canal at Soldier’s Island, west of Sallins. Unfortunately, the culvert at the old Limerick Road makes it impassable to walkers, cyclists and boaters. 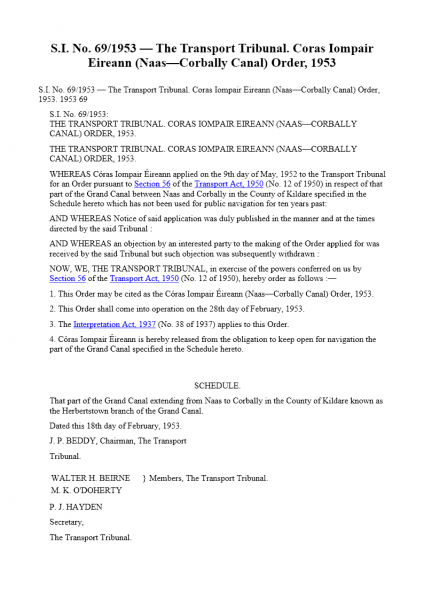 The Transport Tribunal in Feb 1953, released CIE of its obligation to keep the Corbally/Herbertstown Branch open for navigation, the thinking at the time was there was no future for it. The road authority in 1954 was then allowed to build this barricade across the canal and its verges. It seems amazing today but it was at a time when canals meant transportation and people did not see a future for leisure activities and tourism on the waterways. 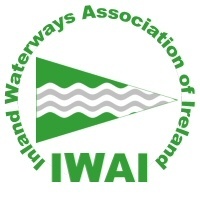 The IWAI, founded in 1954, focused all their energy in the initial years on ensuring there would be a future navigation on the Shannon. It was not until the 1960s that the idea of canals as a recreational facility came into vogue and by then it was too late for the Corbally/Herbertstown Branch. Until recent years, there did not seem much hope of changing this disastrous decision, as the road was the major artery between Dublin and Limerick. However, now this has changed and the IWAI is actively campaigning for the reopening of this canal branch all the way to Corbally Harbour. The concept of a Linear Park for local people and visitors is attractive, allowing boats to travel along it and people to walk and cycle along the towpath, with resting places for walkers. There is a range of photographs in our Waterways’ Gallery section showing trips down the Corbally Branch in recent years, giving an indication of the potential of this amenity.